Suspicious visitor at the History Mouseum. 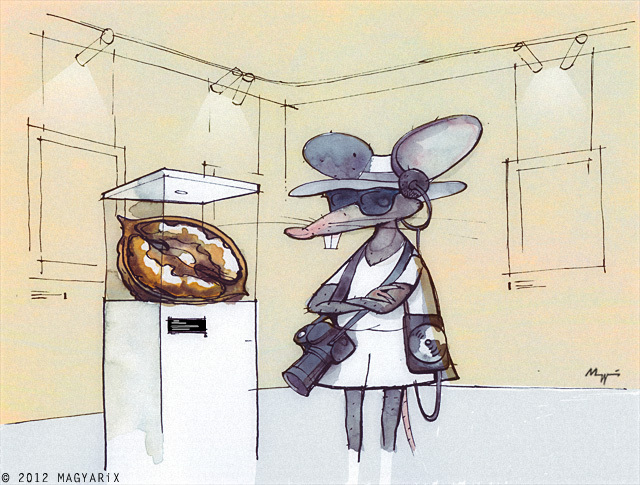 Haha, what a great mouse tourist/burglar person! Very nicely done. Great exhibit, too. I wonder what will happen! This is Funny..great casual pose by the mouse..beautifully coloured and drawn as usual! I wonder, what sort of music is a good backdrop for viewing a walnut display? Or is he listening to the museum guide? Almost can imagine him standing there for hours without moving, just staring at that juicy morsel, don't know why. This one invites all sorts of ideas. Good one. HI. Came over via Rod's blog.